Author Written by Velmurugan Saravanavelu and last updated on Posted on December 7, 2017 . 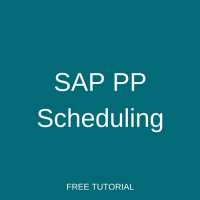 Welcome to the tutorial about scheduling in SAP PP. This tutorial is part of free SAP PP course. SAP PP scheduling is used to calculate start date/start time and end date/end time for a production order or operation. Here you will learn about scheduling production operations in SAP ERP. There are two methods of scheduling in SAP and especially in production planning. Basic dates scheduling. Basic dates scheduling is calculated by considering the values like goods receipt (GR) processing time, in-house production time and planned delivery time from material master (MRP 2 view). It calculates basic start date and basic finish date for an order. Lead time scheduling. Lead time scheduling takes value from routing operation times (setup, machine, labor, etc.) to calculate operation start date, start time, finish date and time. There are different scheduling types commonly used in Production Planning and especially in production orders. In forward scheduling, SAP system schedules the order based on basic start date and determines the schedule end dates. In backward scheduling, SAP system schedules the order based on basic end date and try to determine schedule start date. In today scheduling, SAP system calculates schedule end date by considering schedule start date as current date. In only capacity requirements scheduling, basic dates are copied as schedule dates. Operations will not be scheduled. Basic finish dates are calculated based on requirement date (demand). SAP system adds lead times (GR processing time, in-house production time, etc.) defined in MRP 2 view to that to determine basic start date. It also adds opening period defined in scheduling margin key (MRP 2 view). Opening period is the number of days required for a planner to convert a planned order to a production order. Production start date/time and finish date/times are calculated by scheduling individual operations defined in routing. Then, schedule start and finish dates are calculated by adding floats (defined in scheduling margin key) to the production start dates. Control key decides that whether an operation needs to be scheduled or not. If scheduling indicator is activated in the control key, SAP system will schedule the operation. Otherwise, it will not. When system schedule an operation, it uses the following parameters from master data. Operation times and base quantity from routing. Formula for scheduling from work center. Inter-operation timings from routing or work center. Break time and shift sequences. In routing, each operation contains setup, machine and labor hours required to produce the base quantity. SAP system uses this information to calculate the total time required for that operation. Let’s say that in routing we have entered machine time 120 mins for the base quantity of 500 PC. When an order for the quantity of 1200 PC is created, SAP system will calculate the total time required for this operation as follows. This calculation is maintained inside the scheduling formula in a work center. Here, operation split is defined in routing where in this example it is ‘1’. Inter-operation time is time between operations in the work centers. In SAP, there are 3 inter-operation times available. Queue time. Queue time is time required before processing the material in a work center. Wait time. Wait time is the time material must be kept after processing in a work center. Move time. Move time is the time required to move the material from one work center to another after processing. Let’s consider this example from the fastener industry which deals with manufacturing bolts and nuts. We will consider only the final stage of operation when after bolts are produced they will be painted and packed. Let’s say before painting previous batches are in queue for 10 mins (queue time) due to shorter duration of preceding operation and longer duration of painting operation. After painting, this material must wait for 15 mins (wait time) for drying. Then, it will be moved to packing location using trolley which takes 10 mins (move time). SAP system will calculate break time from work center master data. If any shift sequences are defined in the work center, SAP system takes break time in shift break entered in the shift sequences. Else, it will take the total break time entered in the capacity header. Shift sequences are entered with exact break hours which will be considered for scheduling and capacity calculations. These shift sequences will be assigned to a work center. When SAP system tries to schedule an operation, it first tries to schedule it within the basic dates. When schedule start date falls before basic dates, it tries to adjust the dates by reducing the inter-operation timings except wait time. From the example discussed above, we can reduce the queue time and move time but cannot reduce the wait time. Because painted bolts must wait for 15 mins in order to get dry. We can maintain standard and minimum queue time in work center and routing. SAP system will first consider standard queue time but if scheduling dates falls before or after basic dates, it will take minimum queue time. If after considering minimum time SAP system finds that dates are not within the basic dates, it will apply reduction strategy defined in routing operation. SAP system will apply reduction step by step for each of reduction levels. Try to reduce 50% of the queue time. Try to reduce 100% of queue time and move time. Try to reduce 100% queue and move times and try to apply operation overlap defined in routing operations. Try to reduce 100% queue and move times and try to apply operation overlap and operation split defined in routing operations. Here, operation overlap and splits will reduce the lead time of the operation. When system schedule an operation or production order, it considers factory calendar from the plant and excludes the non-working days and holidays. When there is a business scenario where the production calendar is different from the plant calendar, we can assign a production specific calendar in a work center. So that at the time of scheduling SAP system considers working days from the work center instead of the plant calendar. Congratulations!!! The best documentation on the internet!! Keep it up and do post on other SAP PP topics. This is translates to 23 hours, 59 mins, 54.216 secs >> to be exactly 54 and 13.01 mileseconds. Do you know how this last mileseconds of 13 are round? always up or down, and if it is configurable? Great document by away!! thanks a lot.